June 16, 9 am PST. That's when AMD is launching its new Fiji graphics cards with HBM (high bandwidth memory). Or, at least, that's when AMD will finally be talking about the graphics cards—we don't know for sure if they'll be immediately available, or take a few weeks to hit the market. But they're coming, and coming soon. AMD held a press conference at Computex on Wednesday to talk about its new Carrizo notebook processors. 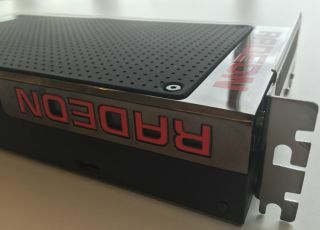 A few months back, it was rumored that AMD would launch Carrizo at the hardware show in Taipei, but that didn't turn out to be the case, perhaps because E3 seemed like a better event to launch a graphics card, or due to some position jockeying with Nvidia's 980 Ti. We'll have to wait a couple weeks to find out what AMD has cooked up. While AMD's Computex press event was mostly about notebook APUs, the GPU powering AMD's new cards did make a brief appearance in Taipei, however—CEO DR. Lisa Su held up the GPU on stage to tease the E3 reveal.